The forthcoming BAA Deep Sky Section meeting prompted me to process one of my sets of deep sky data which has been hanging around. 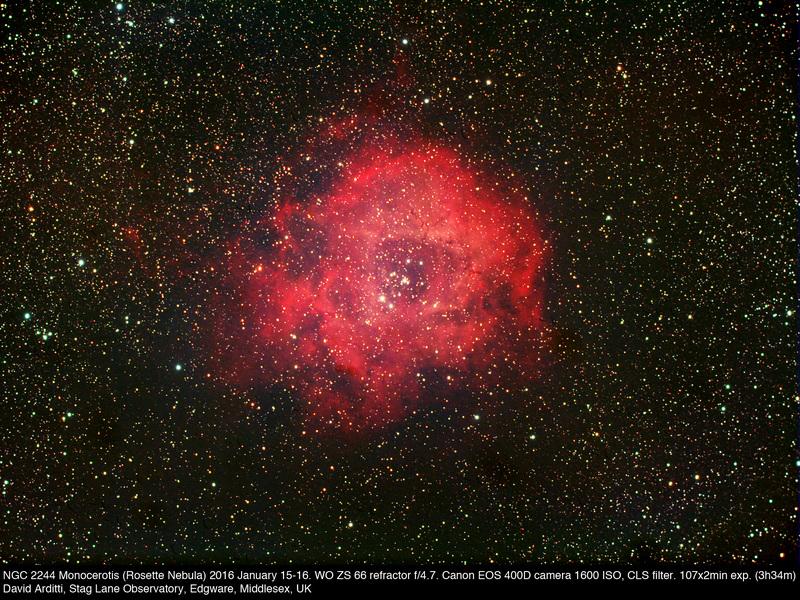 This is a wide-field Rosette, taken with a modified DSLR from Outer London over two nights in January. I had one problem with the processing, which I may describe as ‘dark worms’. These are not real features in space, but an artefact I guess caused by over-corrected hot pixels turing out dark in calibrated images and trailing with the stacking of slightly displaced unguided exposures. I blurred these ‘worms’ out by outlining them at 200% scale and then using Photoshop’s ‘Shape Blur’ function, but this is not a perfect treatment for them. Click twice to see at full size. My name is Pierre Lemay. I’m a Canadian amateur astronomer and telescope maker. I’m in the UK for the upcoming week, and in London for the next few days and I was over at the Foyles book store this afternoon, looking over your 2008 book on amateur observatory construction. Congratulations, it is a well written book with practical advice. Also, congratulations on your excellent website. It’s very well thought out. In your amateur observatory book you mention there exist three types of observatories: roll away, roll off roof and dome. If you ever re-edit your book you might want to add a subset to the roll away type of observatory: the pivoting or hinged cover type. Last year I designed and built a modern version of this type of telescope shelter for my 20 inch ball scope. You can read more details of this particular shelter design on my website (www.telescopelemay.com ). The telescope it houses is also the subject of an article in this month’s March 2016 edition of the American astronomy magazine Sky and Telescope. Anyway, just thought I would get in touch with you, say hello and wish you all the best with your astronomical activities.